A contemporary showpiece! 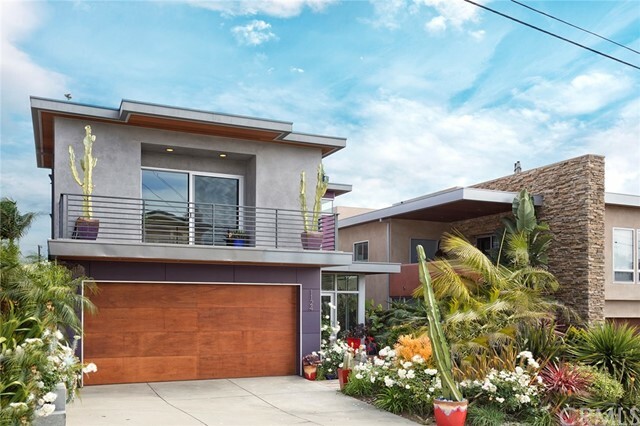 This impeccable 5 bedroom, 4 bath home in a quiet Hermosa hills neighborhood is just a short trip from the beach, the parks, the greenbelt, and top schools. Stunning from the street with its modern architectural details, custom garage door and lush landscaping, this 3,117 square foot home feels bright and open, yet serene and private, with beautiful ocean views from the spacious 2nd floor balcony and panoramic rooftop deck—just imagine the entertaining you’ll do here! Inside, gleaming Brazilian hardwood floors invite you upstairs into everyone’s favorite space: the enormous open living room and chef’s kitchen. The chic kitchen features lots of sleek counter space, custom cabinets, stainless Thermador appliances, walk-in pantry and a breakfast bar, while the living room boasts a dramatic fireplace, dining area, beverage area and large south-facing balcony—perfect for catching ocean breezes. Also upstairs is a guest bath and lovely bedroom or office with private balcony. Downstairs you’ll find 4 more bedrooms—including the master suite with walk-in closet, spacious en suite bath and private patio or small yard—another en-suite bedroom with bath, hall bathroom, laundry room and the spacious 2-car garage. Built in 2011 with every detail—Mahogany doors, LED lighting, CAT 5 wiring, Central Vacuum and more. Make this modern masterpiece yours!